I recently needed a birthday card that was ready to go in a jiffy. I went straight for the Let Your Hair Down Hostess Stamp Set. And, have you noticed that I am incorporating a lot of tags for the card fronts? They really simplify the card-making process. The new tag toppers – Scalloped Tag Topper Punch and Angled Tag Topper Punch – make it even easier, however, for this card, I created my own topper with an angle cut to both top edges of the rectangle piece of Bermuda Bay Card Stock to eliminate the ribbon slot. I inked the namesake sentiment using Bermuda Bay Classic Ink, and cleared off the ink from the words “birthday” and “hair” with the corner of a baby wipe, re-inking those words using my Strawberry Slush Stampin’ Write Marker. It is stamped on the Whisper White card stock, purposely lined up close to the right edge in order to punch the left side with the Spiral Border Edge Punch to give the appearance that the sentiment was ripped from a spiral notebook. 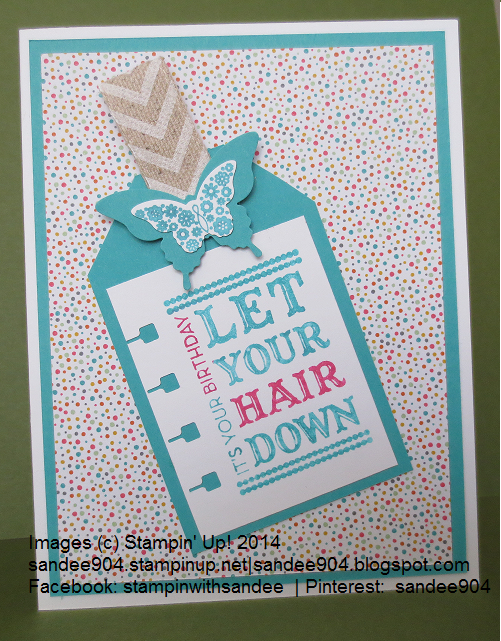 The Chevron ribbon piece is simply stapled to the top of the tag and the staple is hidden with a stack of butterflies, solid Bermuda Bay card stock punched with the Elegant Butterfly Punch, and the image from the Papillon Potpourri Stamp Set and punched with the Bitty Butterfly Punch. A single Rhinestone in the center of the butterfly body was the finishing touch, but I took the picture before that happened. Oopsy!. The background is a 5” x 3 3/4” piece from the Confetti Celebration DSP – I love this fun DSP – and layered on a 5 1/4” x 4” piece of Bermuda Bay card stock. If you are in need of exact measurements, please sign up to follow my blog and I’ll send the card recipe to you for free. Or send your request to my email address.